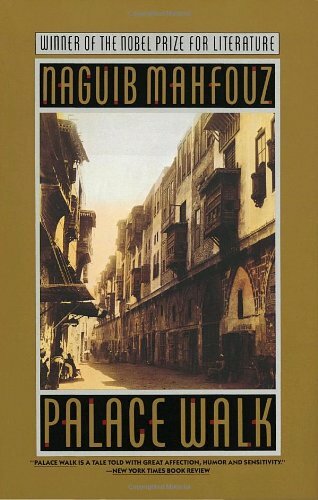 The Palace Walk, by Naguib Mahfouz. A wonderful, old-fashioned novel about a family in Cairo at the time of World War I.
Naguib Mahfouz received the Noble Prize for Literature in 1988, the first Arabic writer to do so. The Palace Walk is one of a trilogy of novels he wrote, named after the streets of Cairo. A probing psychological examination of the members of one family, it is a fine example of why he was honored. The Palace Walk opens with an unnamed woman waking at midnight to greet her husband when he returns from his nightly drinking and carousing. Mahfouz sensitively describes her thoughts and feelings as she considers her place in her husband’s household. It was her duty to obey him without reservation or condition. She yielded so wholeheartedly that she even disliked blaming him privately for his nights out. She became convinced that true manliness, tyranny, and staying out till after midnight were common characteristics of a single entity. With the passage of time she grew proud of whatever he meted out, whether it pleased or saddened her. No matter what happened, she remained a loving, obedient and docile wife. She had no regrets at all about reconciling herself to a type of security based on surrender. Her husband returns, and speaks her name, and it is he, al-Sayyid Ahmad, that is the main character of the book. Later chapters focus on her and the couple’s five children, all of whom share her fear and awe of their father. To the rest of the world he was another person. With everyone else—friends, acquaintances, customers—he was a different person. He received his share of respect and esteem but above all was loved. He was loved for the charm of his personality more than for any of his many other fine characteristics. His acquaintances did not know what he was like at home. The members of his family did not know him as others did. Not surprisingly the family household was full of anger. Amina, the wife, was a person who does not believe she has the right to get angry, and the children learn to conceal their emotions. The father, however, was accepted as having a “sharp temper, which was not held in check at home by the brakes of civility that he employed to perfection outside his household.” Even when his anger was not justified, he believed that his expression of it was beneficial because it could prevent future causes of irritation. Lies were accepted as a shared way of avoiding confrontations, but Mahfouz explores their secrets. Much of the action of Palace Walk centers on the fact that the older children were growing up, marrying, and seeking independence. Al-Sayyid had no patience with their maturation. When a man requested to marry one of the daughters, the father explodes “No daughter of mine will marry a man until I am satisfied that his primary motive for marrying her is a sincere desire to be related to me. . .me. . . me. . me.” He responded even more violently to his sons’ attempts to be their own persons, fearing that they will bring shame onto his name. When his oldest son follows his example in drinking and chasing women, the father swings between anger at him and pride that the boy is as lustful as himself. As the story of marriages and tentative rebellion progresses, Egypt nationalists were pushing for independence from British rule. The idealistic middle son, a law student denied the wife he wanted, was swept up in the demonstrations. Al-Sayyid was vaguely supportive of Nationalists, as long as patriotism did not interfere with his enjoyment of his friends and his lovers. The idea that any son of his would place duty to the nation above duty to his father left him furious. “The only word that counts here is mine, mine, mine….” The boy’s mother was consumed with fear about the risks he is taking. Mahfouz shows the mix of dreams of importance and self-grandeur that led the son into danger rather than a clear sense of patriotism. As in the opening description of Amina, Mahfouz carefully explores the conflicted and secret feelings of the family members. He sometimes uses stream of consciousness techniques to explore their inner contradictions. His characters are sometimes exaggerations, but we easily recognize their behavior. Mahfouz neither blames nor praises his characters, but he reveals clearly and often humorously reveals that his sympathy lies with those who suffer the tyranny, not the one who enforces it. The Islamic faith was fundamental for this family. Phrases praising God or asking for His protection are frequently spoken by all the family. Often, however, it seems like religion is little more superstitions to protect them from jinns (ghosts), outside threats like the British, or each other. Certainly Islamic faith does not keep al-Sayyid Ahmad from his deep enjoyment of wine and his adultery. Although al-Sayyid Ahmad uses Islamic traditions to force the obedience of his wife and children, Mahfouz makes clear that not all Islamic men were as rigid and demanding as he and not all Islamic women as submissive as his wife. In fact there was a clear difference between Amina and other Muslim women. Angry to her daughter-in-law, she asked “How can she claim rights for herself that no other women have ever claimed?” Mahfouz shows how Islam is part of his character’s lives, but that Islam is not to be blamed for their flaws. The religion could be used to demean women, but the men, not the religion, are at fault. We have discussed what should be expected of writers of historical fiction. Can and should they reflect current attitudes about issues like race and gender? I was impressed with Mahfouz’s depiction of women in Palace Walk. The female characters are not the main focus of the book. He is no feminist suggesting anachronistic personal or social alternatives. What he does well is treat the women in the book as full human beings with a range of qualities. He lets us see the unfairness of how they are treated, specially by the men who define their lives. In his depiction of a specific time and place, unfamiliar to many readers, Mahfouz creates characters and tells a story that transcends its particulars and points out flaws we see in ourselves and those around us. The ability to do this is for me a sign of a great writer. I strongly recommend this book to all readers, especially those who enjoy big sprawling novels of another time and place. I already read a book for Egypt (Woman at Point Zero by Nawal El-Sadaawi), but I keep hearing good things about Mahfouz and am hoping to read this trilogy eventually. Your review definitely reinforces my desire to read it! Excellent review. I have heard a lot about this powerful book. Thanks to you both. I certainly hope that you get a chance to read it. Thanks for mentioning me. I am glad I signed up for your blog. You are reading some interesting books.